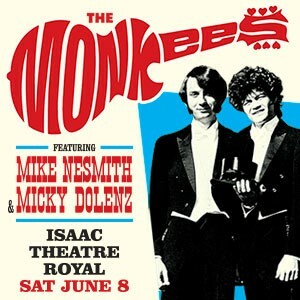 The Monkees Michael Nesmith and Micky Dolenzwill hit New Zealand this coming June. As well as all of those marvellous Micky hit singles, this will be the first time Mike has appeared in Australia or New Zealand since the release of his 1977 “Live At The Palais” album so be assured the shows will highlight many of Nesmith’s compositions, including some that have never been performed live. “Last Train to Clarksville”, “Listen To The Band”, “Mary Mary”, “Different Drum”, “(I’m Not Your) Steppin’ Stone”, “The Girl I Knew Somewhere”, “I’m A Believer”, “Good Clean Fun”, “D.W. Washburn”, “Circle Sky”, “Randy Scouse Git”, “Papa Gene’s Blues”, “Take a Giant Step”, “What Am I Doing Hangin’ Round”… and that’s less than half of what you’ll get to singalong to on the night. VIP packages are available. VIP Packages include access to soundcheck featuring deep cuts not performed during the concert, a signed A3 poster, priority entry to the show and a commemorative VIP laminate. A very limited number of Platinum VIP tickets are available also giving fans the opportunity to meet Mike and Mickey and get a photo on their own phone. The Monkees Present: The Mike & Micky Show is a unique concert experience. Times may change but infectious pop hits and wonderfully charismatic characters stay in our hearts and memories forever. Times are approx. and subject to change at any time. The Isaac Theatre Royal is the spiritual heart of Canterbury’s arts scene; an iconic theatrical venue that has played host to spectacular shows and spellbound audiences for more than a century. © Isaac Theatre Royal. Privacy Statement.